Entering Virginia Miller’s survey of Leslie Lew’s paintings is like traveling back to a simpler time to reunite with childhood companions. These are not just personal memories, but universal icons that have illustrated American life for decades and evoke nostalgia in mature audiences while sparking recognition in younger viewers. Colorful characters burst from the walls with an infectious exuberance. The superhero trinity of Batman, Spiderman and Superman swoop in to rescue us from the banality of their big-screen counter-parts, reminding us why they continue to be reincarnated for each successive generation, yet lose a little luster in the slick technological translation. “I’m not painting Lynda Carter as Wonder Woman, but the original comic book character,” Lew points out. 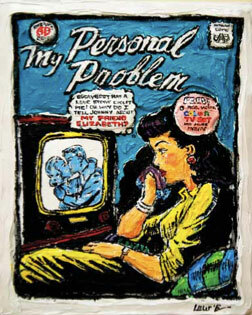 Leslie Lew, Personal Problems–Dear Abby, 2012, sculpted oil on canvas, 20” x 16”. Courtesy of ArtSpace/Virginia Miller Galleries. What distinguishes Lew from other artists who use vernacular imagery is her raised paint application, an original technique she coined “sculpted oil,” a fitting description for the dramatic relief she creates by building up and carving into layers of oil paint. The exaggeratedly embossed effect has a tactile quality that gives high definition a hand- wrought twist hard to capture in one-dimensional reproductions. Lew’s subject matter and vibrant palette share the pop preoccupations of her compatriots in the 1980s East Village art scene, where her friend Jean-Michel Basquiat introduced her to Andy Warhol, who negotiated to trade work but died before the exchange could take place. Her spirited aesthetic also reflects her studies at the School of the Art Institute of Chicago under Ray Yoshida, who had previously taught members of the city’s Hairy Who, a 1960s exhibiting group with a similarly cartoonish style and playful sensibility. But her earliest influence was the branding imagery of her father, a well-known advertising director who designed the campaigns for Kellogg’s cereal that she pays tribute to with her Snack Pack of Sugar Smacks, Rice Krispies and Frosted Flakes. He also introduced her to Norman Rockwell, whose sentimental celebration of Americana still resonates with Lew. The sincere tone of her homages resists the cynicism and irony of much appropriation for a cultural commentary without the consumer critique. She reprises some of her inspirations – like the Barnum’s Animals cracker boxes that she periodically paints and recently replicated in wood, enlarged to 16 x 12 inches complete with the fine print and packaging details on all sides and the trademark string initially attached to hang from Christmas trees. The pigment is thicker on the newer canvases, the grooves deepening with her skill and maturity, yet she retains a youthful verve at age 60 that still infuses her compositions with a bubbly optimism that makes it hard to resist smiling in their presence. 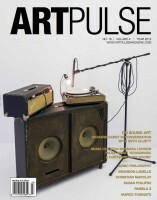 Margery Gordon is a freelance arts journalist and regular contributor to ARTnews, Art+Auction, ArtInfo.com and the official Art Basel Miami Beach Magazine, among other publications. She is a professor at Barry University in Miami.